The basic rules of volleyball allow for regular game interruptions such as player substitutions and time-outs. Interruptions may be requested by either the playing captain or coach. The request is made by showing the corresponding hand signal after the ball is whistled out of play before the whistle for the next serve. Sequence of Interruptions - Basic Rules of Volleyball If a substitution is requested before the start of a set, it should be permitted and recorded as a regular substitution in that set. A request for a time-out may be followed by another request for a time-out and a request for a player substitution may be followed by a request for a player substitution of the opposing team without resuming the game. However, a team may not make consecutive requests for player substitutions during the same interruption. A subsequent request by the same team during the same interruption will result in an improper request. Time Outs - Basic Rules of Volleyball All time-outs that are requested last 30 seconds. During time-outs the players in the game must go to the free zone near their bench. Players may remain on the court or go to the free zone near their team bench. Any team member listed on the roster may participate in the time-out. Coaches and non-playing team members may not enter the court. Referees may direct teams to move to the free zone near their team bench for administrative purposes. Teams may return to the court when permitted by the referees. A substitution requires the referees authorization A substitution is the act by which a player, after being recorded by the scorer, enters the game for another player. The substitute occupies the position of the player they are replacing who must then leave the court. 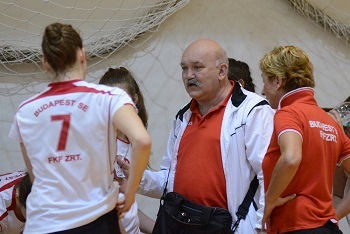 Limitations of Substitutes - Rules in Volleyball One or more players may be substituted at the same time. Twelve substitutions are the maximum permitted per team per set. Substitution of one or more players is permitted at the same time. A player in the starting line-up may leave the set and re-enter, but only in his/her previous position in the line-up he/she first entered. Unlimited individual entries by a substitute within the teams allowable 12 subs are permitted. Each entry must be to the same position in the line-up. More than one substitute may enter the game in each position. The sanction for a wrong position entry is an improper request. An injured player, except the libero, who cant continue playing, should be substituted legally. If this is not possible the team is entitled to make an exceptional substitution. An exceptional substitution means that any player that isnt on the court at the time of the injury, except the libero or his/her replacement player, may substitute into the game for the injured player. The substituted injured player isnt allowed to re-enter the match. An exceptional sub cant be counted in any case as a normal substitution. Special three minute time-out situation - Basic Rules of Volleyball If the injured player is unable to play and a legal or exceptional substitution cant be made, the referee must grant a special time-out of up to three minutes. Play will resume as soon as the injured player is able to continue. In no case should the special time-out exceed three minutes. After the three minutes, the team many request a legal time-out. If after the three minutes and time-out(s) the injured player cant continue to play, then the team is declared incomplete. No player may be granted more than one three minute injury time-out during a match. If a player becomes injured to the extent that a second three minute time-out would be required, the team is declared incomplete. Substitution for Expulsion or Disqualification An expelled or disqualified player must be substituted through a legal substitution. If this is not possible, the team is declared incomplete. Substitution rules state that a substitution is illegal if it exceeds the Limitations of Substitutes described above. If an illegal sub has been made, and play has resumed, the following procedure shall apply The team is penalized with a loss of rally and the substitution is rectified. If the team at fault is receiving and discovery is after the opponents have served, all points previously scored by the offending team shall be retained. The serving team is awarded a point unless the error is discovered after the serving team has scored a point. In this case, no additional point is awarded. If it isnt possible to determine when the error first occurred and the offending team is serving, only the last point in that term of service will be removed. Substitution Procedures - Rules in Volleyball Substitutions must be carried out within the substitution zone. The substitution shall last only the time needed for recording the sub on the scoresheet, and allowing the entry and exiting of players. At the moment of substitution request, the substituting player/players shall be near the substitution zone and ready to enter. If a request is made for two substitutes and includes both a legal and an improper entry, the legal substitution is allowed, the improper substitution is denied and an improper request or team delay (if the team has been previously charged with an improper request) is recorded for the team. If the incoming substitute enters the substitution zone, the action is considered a substitution request by the captain/coach. No further action by the captain/coach is required. Any significant delay by the substitutes entering the substitution zone shall result in the team being limited to one substitute. The first improper request in the match that doesnt affect or delay the game shall be rejected without any other consequences. If a change in request is due to a referees mind change, the request will be honored and no sanction given. A repeated improper request in the match constitutes a delay. An improper request includes a player substitution that would result in a wrong position entry. Improper requests remain enforce for the duration of the match. A request for 1st or 2nd time-out may be honored immediately subsequent to an improper request for substitution because of wrong player or excessive team substitution. A proper request for substitution may be honored immediately subsequent to an improper request for time-out. A delay in substitution results in refusing request for the substitution. No additional substitution requests from that team may be made until the next interval when the ball is out of play. Delay Sanctions - Rules in Volleyball Delay Warning and Delay Penalty are team sanctions. Delay sanctions remain in force for the entire match. All delay sanctions are recorded on the scoresheet. The first delay in a match by a team member is sanctioned with a delay warning. The second and subsequent delays of any type by any member of the same team in the same match constitute a fault and are sanctioned with a delay penalty  loss of rally. Delay sanctions imposed before or between sets are applied in the following set. Injury - Basic Rules of Volleyball If a serious injury was to happen while the ball is in play, the referee must stop play immediately and permit medical assistance to enter the court. The rally is then replayed. If an injured player cant be substituted legally or exceptionally, the player is given a three minute recovery time, but not more than once for the same player in the same match. If the player doesnt recover, the team is declared incomplete. External Interference - Basic Rules of Volleyball If theres any external interference during the game, play is stopped and the rally is replayed. Prolonged Interruptions - Basic Rules of Volleyball If unforeseen circumstances interrupt the match, the referee, organizer, and control committee decide the measures to be taken to re-establish normal playing conditions. if the match is resumed on the same playing court, the interrupted set shall continue normally with the same score, players, and positions. The sets (games) already played will keep their scores. if the match is resumed on another playing court, the interrupted set is cancelled and replayed with the same team members and the same starting line-ups. The sets already played will keep their scores. if one or several interruptions occur exceeding 4 hours in total length, the whole match is replayed. Intervals - Basic Rules of Volleyball All intervals between sets last 3 minutes. During this time period, change of courts and line-up registrations of the teams on the scoresheet are made. Change of Courts - Basic Rules of Volleyball After each set, the teams change courts with the exception of the deciding set. In the deciding set, once a team reaches 8 points, the teams change courts without delay and the player positions remain the same. If the change doesnt take place once the 8 points is reached, the change will take place as soon as its noticed. The score at the time the change is made remains the same. Kenda S. Lenberg. 2005-2006: USA Volleyball Domestic Competition Regulations: pp. 4251.